Indium Corporation will feature Heat-Spring® thermal interface materials at PCIM Europe, May 14-16, in Nuremberg, Germany. Heat-Spring®, a compressible thermal interface material (TIM), is a patented technology specifically designed for high-power thermal applications. This soft metal TIM is made with RoHS-compliant indium metal, which is six times softer than lead. It has a thermal conductivity of 86W/mK and a melting point of over 150°C. It is non-greasy and requires no-clean up or replacement. Increasing the life of power modules by providing a robust, stable TIM is a key to success. From IGBTs to RF and high brightness LED applications, the clean Heat-Spring® is user friendly, recyclable, and reclaimable. Innovative packaging reduces cost and time. Heat-Spring® is packaged in tape & reel or tray packaging, enabling automated placement. It is available in custom shapes and thicknesses. 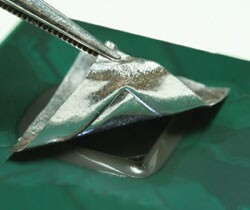 For more information about Indium Corporation Heat-Spring®, visit www.indium.com/TIM/ or email tim@indium.com.